Sípon™ – GattaCo Inc. / Pte. Ltd.
GattaCo has developed a new technology, which we call Cap-ResetTM for Capillary Pressure Re-Set, that automatically eliminates the breakthrough pressure requirement of filtration membranes. This allows the plasma to be rapidy separated, collected and metered to a precise volume all using passive capillary forces only. There are no moving parts and no operation or step is required of the user other than to add blood and dispense plasma. The gray circular bulb seen in the photo above is for dispensing the plasma only, and is not involved in the separation or collection process. 1. 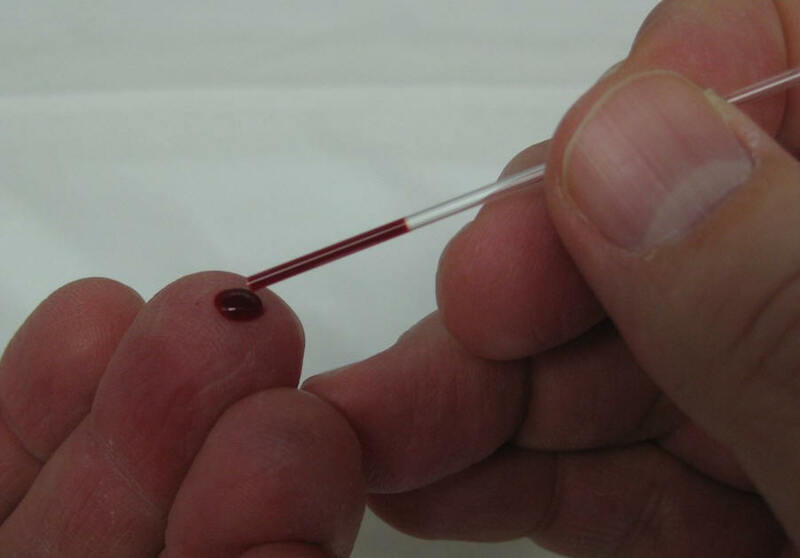 Using a lancet (not provided in the EAP package, see Package Contents below) stick a clean finger to release capillary blood, in a similar manner as is commonly performed for self-glucose testing. Recommended finger cleaning procedure includes washing with warm, soapy water and rinsing with warm water. The warm water helps increase blood flow to the finger tip. If the lancet being used has a variable depth setting, a deeper setting (usually a larger number) will increase the availability of capillary blood. Fill a 75μL heparin coated capillary tube (included in the EAP Package). Alternatively, a capillary tube with a different anti-coagulant coating may be used, or 75μL of whole blood with anti-coagulant from a vial, Vacutainer® or bag may also be loaded into an uncoated capillary tube or pipette. Note: The Sípon must be held in a vertical position (as shown) during the entire loading, separation and collection process. 2. If using a capillary tube, approach the inlet channel of the Sípon with the tube in a horizontal position. Once at the inlet, move into a vertical position and insert the tube or pipette tip approximately half a centimeter into the channel. Allow blood to pass into the channel, slowly withdrawing the tube or pipette tip as the channel fills. 3. Carefully remove the tube or pipette tip from the inlet channel to allow the blood to pass into the plasma separation membrane chamber (PSM Chamber). Filling the PSM Chamber usually takes about 15 seconds. The height of the blood in the inlet channel will drop as blood enters the PSM Chamber. However not all blood will pass into the Chamber initially, but some will remain in the inlet channel. The remaining level of blood in the inlet channel will slowly drop as plasma is collected in the serpentine Plasma Collection Channel below the membrane. 4. After about 1 to 1.5 minutes, plasma will be seen emerging from below the PSM Chamber, filling the serpentine Plasma Collection Channel. Progress to this point may be observed by viewing the channel on the back side of the Sípon under the membrane as it begins filling with plasma from the top until is passes into the serpentine collection channel below. After an additional 2.5 to 3.5 minutes (totaling under 5 minutes from blood sample loading described in step 3 above), the entire 15μL volume of plasma will be collected, and will stop at the entrance to the dispensing channel. Due to the clearness of the collected plasma and transparency of the collection channel, progress of filling, or position of the advancing meniscus, may be difficult to observe. To aid in observing the advancing meniscus, the Sípon may be gently tilted until room light reflects off the upper surface of the device. A filled portion of the channel has a slightly different reflection than an unfilled portion. 5. It is difficult to recognize when the Sípon has finished collecting the total 15μL plasma volume, unless the filling process is observed to completion as described in step 4 above. If the filling process is not observed then simply after waiting 5 minutes from filling of the PSM Chamber (step 3 above), you can confidently move to the dispensing step, described in step 6 below. However, if you wish to confirm filling before moving to the dispensing step, you can very gently depress or squeeze the gray dispensing bulb, with only slight pressure, and observe the plasma emerge from the end of the serpentine Plasma Collection Channel, into the dispensing channel. 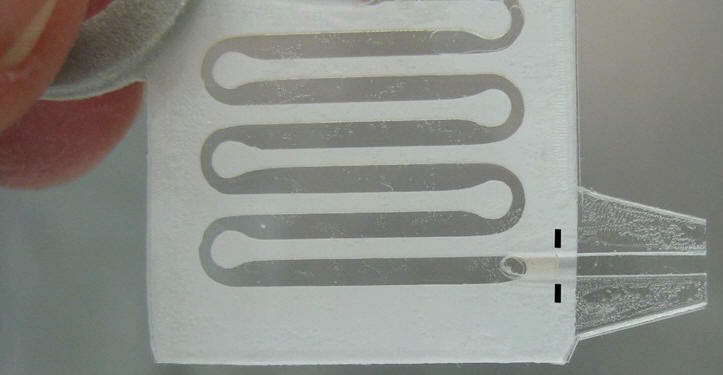 Due to the white background of the entrance to the dispensing channel, and due to the slight increase in thickness of the dispensing channel, the plasma can be seen entering this channel as shown in the photo below. Carefully release pressure on the bulb once observation is complete. 6. 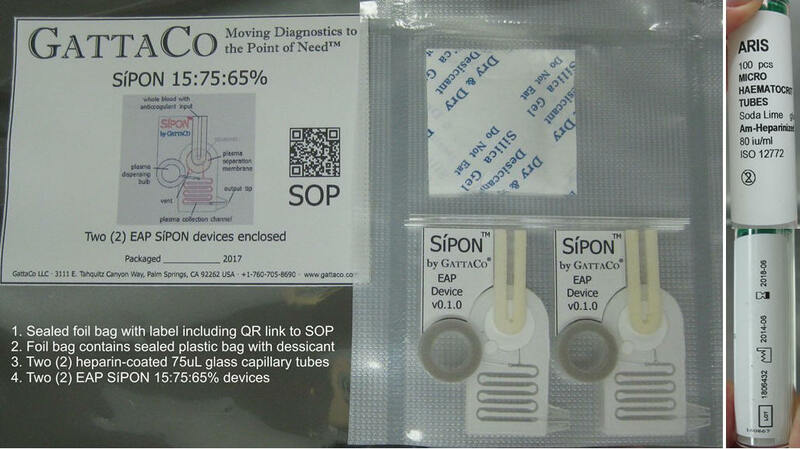 To dispense the collected plasma, hold the Sípon at the label area, not on the gray squeeze bulb area, as it is moved to the desired point of dispensing. Once in position, squeeze the bulb gently but completely. All plasma, metered to 15μL, will be dispensed out. Due to pressure simultaneously applied to the PSM Chamber during this step, the membrane may be damaged and blood, together with any additional plasma, may re-fill the collection channel and even enter into the bulb area after the bulb is released. However, by this time the process of metered separation, collection and dispensing has already been completed and the Sípon may be disposed of using proper biosafety hazard protocols. If you qualify, the package shown below will be sent to you for initial evaluation. The package will be sent free of charge except for shipping charges to international (non-domestic U.S.) destinations. Terms for continuing in the Early Access program will be discussed after your initial evanuation is completed.